I was requested by fellow military spouse Deanna to write this post. If you are anything like Deanna and myself, you might have noticed something about making friends in military life....it can be really hard. I've thought about this a lot. I've seen many spouses talk about how hard it is to make authentic friendships with other spouses. Personally, I've noticed that I feel this weird sense of apprehension about making close friends. Everything felt so temporary. Was this an incredibly dumb way to view friendships? Yes. I honestly thought something was wrong with me when I first moved in with my husband. I spent my college years with some amazing friends and I didn't feel like I struggled when it came to fostering authentic relationships. I spent my summers throughout high school and college with friends that I still have today. Yet here I was, struggling to connect with people. 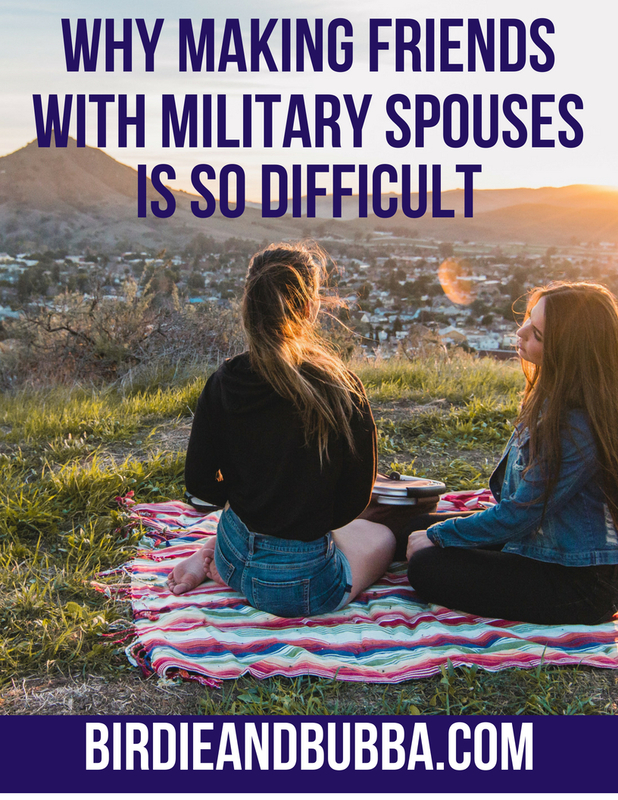 No, it is not the military's job to figure out a spouse's friendships....obviously. But man, I felt lonely as anything for a few months. I was born, raised, and went to school within the same 150 miles radius. To say I lived in a bubble was an understatement. I hung out with people who thought like me, looked like me, believed in the same things I did, etc. This wasn't a bad thing necessarily, but it did not set me up for success when I moved across the country. Let's face it, we like to have friends that are similar to us. When you are moved from that safe haven you grew up in and placed with people from all over the country and with all different beliefs...things can get interesting. The military is a very interesting microcosm of society. You take people from all over the world, then stick them at some base in the middle of nowhere and hope they can work together as a team. Then you add their families into the mix, and hope that they can just figure this all out. Sounds easy enough right? I wanted to make friends who were just like me. Why? Because it was safe. If they weren't like me, I wanted them to be that perfect military spouse friend. The one who I can call when my husband was gone. The one who understands what it is like to be away from family. The one who I can call for everything. The one that did not exist. We can't expect people to be the perfect friend when are all imperfect people. We can't just sit and wait for that bff to show up in our lives and make our new home perfect. We have to be willing to branch out. We have to be willing to be friends with people who may be different from us in nearly every way. This does not mean that you have to lose who you are as a person to gain your group.What I had to do was stop being prideful, and start genuinely forming close bonds with people who are not like me.I have been lucky enough to meet incredible people on this journey. I have made friends who have honestly saved my sanity at times. The military is like a train station, people are always coming and going. Many of my friends are now scattered all over the world. Think of how much modern technology can help us continue to grow these friendships. Not to mention all the fun places you can travel to! My biggest piece of advice is to be open. This doesn't mean you have to hang out with people are truly not a good friend to have, this means to give people a chance. Crummy people are everywhere, but so are genuinely nice people. Don't try to fit people into this rigid set of expectations in order to be your friend. 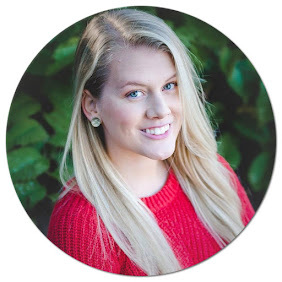 Got a suggestion for a blog post??? Leave a comment! Ah I have not read that one! I am definitely going to look at it! I completely agree with this. I don't have many military spouses as friends since I've started this journey 4 years ago. Partly has to do with the age difference or how spouses are scattered throughout where I live. Sometimes I expect a spark in a friendship but there are far and few. It also doesn't help that I'm somewhat introverted so its harder for me to truly show my personality. I do make my best effort to invite someone out for lunch whenever my husband is on duty or off doing work related things. It's something that I still work on to this day. Yes! Age difference is a huge thing!! Once you are over 25 I feel like there are a lot less people to be friends with.